It’s a command given by S.H.I.E.L.D. Director Phil Coulson in the opening moments of “Shadows,” but it’s also an indicator of this show’s direction in its second season. Following the events of Captain America: The Winter Soldier, S.H.I.E.L.D. is a ragtag group of agents fighting to protect the world from the growing threat of Hydra while on the run from the U.S. government. Fitz has suffered severe brain damage following last season’s finale, and now hallucinates an absent Simmons like she’s a beautiful blonde Cylon. And Ward the traitor is suicidal and grew a beard in his spacious jail cell. 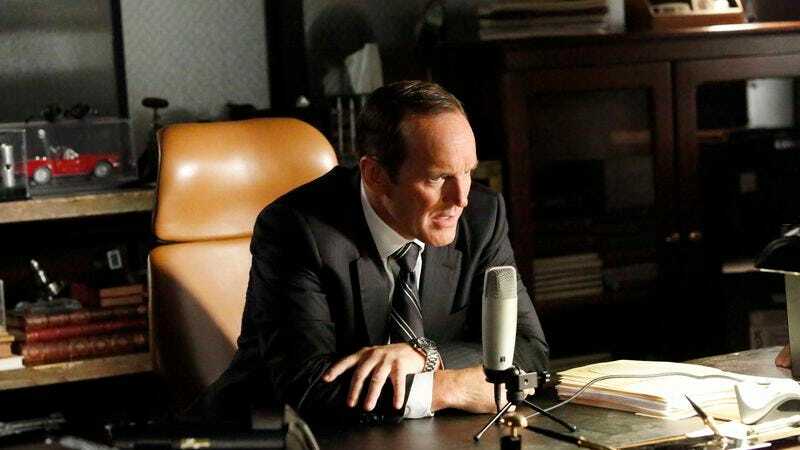 The situation is bleak for Coulson and his team, and the majority of “Shadows” is dedicated to setting the stage, establishing a number of subplots and introducing new characters to be further explored in the future. Agents Of S.H.I.E.L.D.’s first season was reluctant to introduce many characters from Marvel comics, but there’s been a fairly significant shift away from that judging by this season premiere. The S.H.I.E.L.D. team has recruited two new faces pulled from the comics—Lance Hunter (Nick Blood) and Alphonso “Mack” Mackenzie (Henry Simmons)—and the bad guys gain brains and brawns with the addition of Daniel “Kraken” Whitehall (Reed Diamond) and Carl “Crusher” Creel (Brian Patrick Wade), a.k.a. The Absorbing Man. Creel easily makes the biggest impression this week, and it’s refreshing to see this show commit to a superpowered character without feeling the need to overexplain his abilities. He’s simply “gifted” with the ability to take on the physical characteristics of any substance that touches his body. Wade definitely has the Crusher Creel look down, and writers Jed Whedon and Maurissa Tancharoen even find a way to give him his signature ball-and-chain weapon when he faces off against Agent May. The special effects for Creel are solid to quite good at moments, but the fight choreography could be more impactful, especially now that the series is in a slightly less family friendly timeslot. Reed Diamond’s Kraken figures prominently in the opening sequence, which features an appearance from Peggy Carter (Hayley Atwell) and the Howling Commandos as they shut down the last known Hydra cell at the end of World War II. It’s a fun little taste of what we can expect from this winter’s Agent Carter miniseries, and also introduces the Obelisk, the MCU’s latest mysterious object with catastrophic power. As new character Isabelle “Izzy” Hartley (Lucy Lawless in a terrible wig) learns at the end of the episode, the Obelisk is fatal to the touch, and after being in S.H.I.E.L.D. custody since 1945, the weapon is back in Hydra’s hands thanks to Creel and the Kraken, who hasn’t aged a day in nearly 70 years. The new S.H.I.E.L.D. agents are largely forgettable, as this episode doesn’t do much to tell us who they are or why they’re a part of this team. Izzy is another noble S.H.I.E.L.D. agent with a long-standing relationship with Hunter, and that’s pretty all we learn about the two of them. That small bit of background info is supposed to get the audience invested in their relationship so that the episode’s final moments have stronger emotional impact, but it’s not enough. Still, it’s more than what Mack gets. He makes a quick appearance at the top and then occupies the background for the rest of the episode. “Shadows” plants a lot of seeds for the future, but it doesn’t feel like much actually happens over the course of the plot. 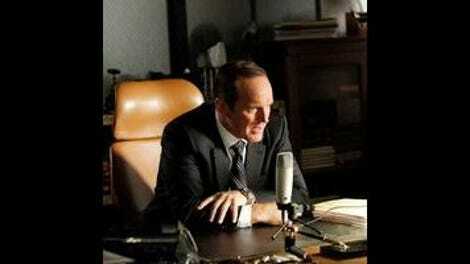 There’s lots of talk from Coulson about having to rebuild S.H.I.E.L.D. in the shadows, but the tension of being on the run and at risk of exposure isn’t felt in the script. The stakes are supposed to be high the entire time, but they don’t reach that elevated plane until the end of the episode, and that moment doesn’t even involve any of the main cast members. After cutting off Izzy’s arm and surviving a car crash pulled straight out of Winter Soldier, Hunter watches helplessly as Creel takes off with the Obelisk, and it would be nice to have that sense of danger permeating the entire season premiere. Agents Of S.H.I.E.L.D. is building a stronger narrative foundation for this season, but it’s still struggling in the style department. The world of S.H.I.E.L.D. needs to be able to feasibly exist in any Marvel movie, so the directors and designers of this series embrace a bland approach that keeps the show from developing its own distinct visual approach. The camerawork is competent, but basic. The lighting is subdued. The environments are generic. This is a secret agent show in a superhero universe, why does so much of it take place in gray close quarters? Shows like Alias prove that it’s possible to capture the suspense, spectacle, and sexiness of a secret agent movie within the limitations of the TV medium, and I’d like to see Agents Of S.H.I.E.L.D. take bolder steps toward establishing more visual character. With a clearly defined villain and mission statement, this show’s second season is already off to a better start than it’s first year, but there’s still plenty of room for the series to grow. The scripts could use more energy, the action could be better choreographed, and it could use a huge injection of style for both the visual and audio elements. There’s so much potential in Agents Of S.H.I.E.L.D., especially as the Marvel Cinematic Universe continues to expand, but the show’s creators aren’t fully exploring it yet. The series can’t always rely on Marvel’s movies to give it a shot in the arm like last season, and the sooner the show embraces what sets it apart from other Marvel fare, the better its chances of thriving on its own. The most exciting casting news of this show’s second season is that Friday Night Lights’ Adrianne Palecki will be guest starring as Bobbi “Mockingbird” Morse, the secret agent turned Avenger who married and divorced Hawkeye in the comics. Lance Hunter makes a casual reference to his ex-wife, which makes me wonder if he may be taking Clint’s place in Bobbi’s life so that the writers could utilize that ex-lover dynamic on this series without using Jeremy Renner. Melinda May got herself a Rachel haircut and it’s a little odd. Still better than Lucy Lawless’ wig, though. Peggy Carter shuts a crate containing something with blue flesh and a tattoo. Could it be the alien that would become the source of GH-325? Mark Waid will be writing a new S.H.I.E.L.D. ongoing comic series bringing this show’s cast into the Marvel universe. A rotating art team including creators like Carlos Pacheco and Alan Davis makes the book very tempting, but a $4.99 price tag for the first issue diminishes my interest considerably.